A bird’s nest, a bundle of tagliatelle, a meringue or even a Slinky. These are some of the descriptions Sydney residents have hit on to describe preliminary images of Darling Exchange. 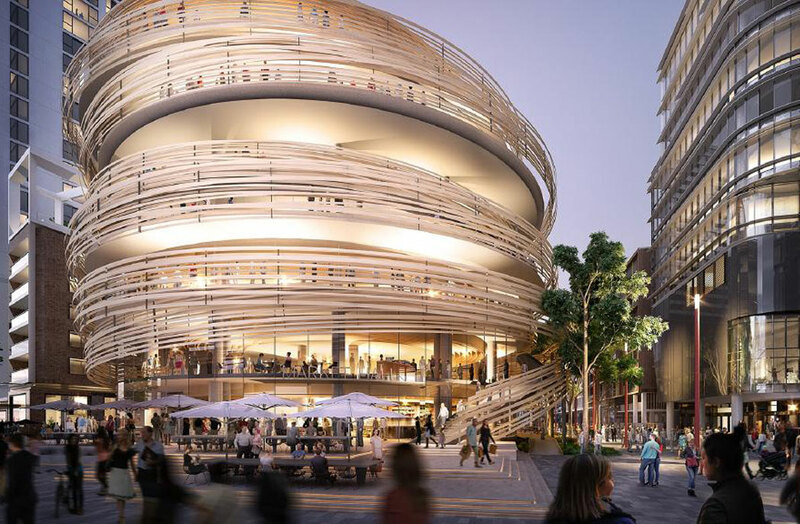 Designed by world-acclaimed Japanese architects Kengo Kuma and Associates (KKA) for Lendlease, the civic building, due for completion in 2018, will be wrapped in 20 kilometres of curved timber. It’s a striking design that calls for a bold approach. Lendlease engaged an Australian architecture practice unlike any other in its field to resolve the project. AR-MA produces complex computational designs that dissolve the traditional distinctions within the architecture, engineering and construction (AEC) industries. Working on proprietary software not used by any other studio in Australia – but also employing staff capable of writing their own code – the architects and engineers at AR-MA output designs in a single digital model that can be shared, and reworked ‘live’, by all stakeholders, from prefab manufacturers to builders, without the need for reinterpretations and ‘shop drawings’. AR-MA director Robert Beson will be exploring these ideas – and talking about the Darling Exchange project – at the upcoming prefabAUS 2017 Conference. Warren McGregor, CEO of prefabAUS, has invited AR-MA to present its work in an international session titled ‘The future and innovation’. “AR-MA is a transdisciplinary practice on the cutting edge of the integration of design intent and design output. Prefabrication plays such a strong part in how the studio delivers its award-winning designs and makes AR-MA a natural inclusion in the exciting line-up of speakers we have at the prefabAUS 2017 conference,” McGregor says. Beson describes AR-MA as a unique coming together of architects and engineers. A working render of the Darling Exchange building by AR-MA. “AR-MA is essentially a hyphenated practice that bridges the gap between design and construction. The way we do that is by building comprehensive virtual design and construction models in which every single element is completely drawn, specified and detailed ready for manufacturing,” says Beson. This ties in perfectly with precision prefabrication of the specified elements, explaining Beson’s appearance at prefabAUS 2017. The conference, organised by its industry’s peak body, is the essential annual forum for those involved in the field of prefabricated construction. “All of our projects are designed for manufacture and prefabrication, so everything is essentially built in chunks in a factory and delivered to site finished and ready to attach to the building,” says Beson. Darling Exchange is the cornerstone of Sydney’s new inner city village, Darling Square, which is being developed by Lendlease. The dynamic civic building will house a new library that will include a makers’ space and an innovation centre aimed at supporting creative and technology start-ups. It will also contain a permanent open market hall, a childcare centre and a rooftop bar and restaurant. Read about prefab homes being made from recycled plastic.